For the 1992 film by Abel Ferrara, see Bad Lieutenant. Bad Lieutenant: Port of Call New Orleans is a 2009 American crime drama film directed by Werner Herzog and starring Nicolas Cage, Eva Mendes, Tom Bower, Jennifer Coolidge, Alvin 'Xzibit' Joiner, Val Kilmer, and Brad Dourif. Though the film's title resembles that of Abel Ferrara's 1992 film Bad Lieutenant; it is neither a sequel nor a remake; according to Herzog, its only commonality is a corrupt policeman as the central character. Both Bad Lieutenant films were produced by Edward R. Pressman. The film premiered on September 9, 2009 at the 66th Venice International Film Festival where it won the Christopher D. Smithers Foundation Special Award for Herzog. It opened in general release in the United States on November 20, 2009. In August 2005, Terence McDonagh (Nicolas Cage) is a New Orleans police sergeant. While cleaning out a locker after Hurricane Katrina, he notices that a prisoner may not have been transferred. When he finds the prisoner about to drown, he mocks him before eventually jumping in the water to save him. He is promoted to police lieutenant and given a medal for his work, but has suffered a serious back injury because of the rescue. As a result, he is prescribed Vicodin which he will most likely need to take for the rest of his life to manage the pain. Six months later, McDonagh is now not only addicted to painkillers, but is habitually using several other drugs including cocaine and cannabis. He has convinced a person that works in the police department to bring him drugs sent to the evidence room. His girlfriend Frankie Donnenfeld (Eva Mendes), a prostitute, also does cocaine and they often share drugs. He has also become estranged from his father Pat (Tom Bower), a recovering alcoholic who can only bring himself to attend to his AA meetings and nothing else, and his alcoholic stepmother, Genevieve (Jennifer Coolidge). Over the course of the film, he uses his position as an officer to bully people and steal more drugs. McDonagh is assigned to investigate the murders of five illegal immigrants from Senegal, who were killed for selling drugs in a gang leader's neighborhood. The gang leader, Big Fate (Alvin 'Xzibit' Joiner), has two associates: Midget (Lucius Baston) and G (Tim Bellow). After both are arrested, Big Fate willingly comes to the police station with his lawyer. As they try to gather evidence against Big Fate, McDonagh goes back to a hotel room where he finds Frankie beaten by one of her clients, a seemingly well-connected man named Justin (Shea Whigham). McDonagh threatens Justin and takes $10,000 from him. Later on, a delivery boy who was an auditory witness of the murder scene goes missing. McDonagh finds the witness's grandmother, who works at a nursing home, and threatens to kill one of her patients to make her divulge where the witness has gone. The old woman has sent him to stay with her family in England, to prevent him from getting involved in gang affairs. In addition to dealing with the murder investigation, McDonagh gets in trouble with his bookie Ned (Brad Dourif) for not paying his debts. What little money McDonagh has is given to a gangster who works for Justin. The gangster now requests $50,000 - five times the amount stolen from Justin - as compensation, and gives McDonagh two days to get it. As a result of his treatment of the old woman, McDonagh is on modified duty and his gun placed in the evidence room. Now angry, McDonagh goes to Big Fate and they become partners, with McDonagh supplying Big Fate with police information. McDonagh now has enough money to pay off his debts to his bookie and uses his surplus earnings to place a new bet. During a celebration of the successful partnership between McDonagh and Big Fate, the gangster shows up, demanding his money. McDonagh offers him a cut worth more than $50,000 from a bag filled with pure heroin, but the gangster wants to take it all. Big Fate and his crew end up killing the gangsters. To further celebrate their partnership, McDonagh implores Big Fate to smoke crack cocaine with his "lucky crack pipe". He does, and McDonagh later plants the pipe at the murder scene of the Senegal family. The department uses this new evidence to arrest Big Fate and his cronies, but when he and McDonagh are alone with Big Fate, McDonagh's partner, Stevie Pruit (Val Kilmer), threatens to kill Big Fate, as he doesn't want him to have the chance to escape conviction. McDonagh is outraged at this idea and arrests Big Fate, showing that despite his addictions he can still perform his duties as an officer. McDonagh is later promoted to police captain. One year later, McDonagh appears to be sober, as do Frankie (who is pregnant with McDonagh's child) and McDonagh's parents, but it turns out that McDonagh is still taking heroin. He encounters the prisoner whom he saved at the beginning of the film, and the man, recognizing McDonagh, exclaims that McDonagh saved his life. The man has been sober for almost a year and offers to help McDonagh finally escape his own addiction. McDonagh simply asks, "Do fish have dreams?" The film ends with the two men in an aquarium, sitting on the floor with their backs against a wall-sized fish tank. The film was first announced in May 2008 with Werner Herzog to direct and Nicolas Cage to star. The script was penned by TV writer William Finkelstein. Actress Eva Mendes, who starred with Cage in the 2007 film Ghost Rider, joined the cast the following June. One major change from the original film was moving the setting from New York City to New Orleans. Herzog insists that the film is not a remake, saying, "It only has a corrupt policeman as the central character and that's about it." At the 81st Academy Awards, Herzog stated that he has never seen Ferrara's film, saying "I haven't seen it, so I can't compare it. It has nothing to do with it." Herzog did not like the idea of a remake and desired to change the title of the film, but was unsuccessful. Herzog stated, "I battled against the title from the first moment on", but added, "I can live with it, I have no problem with it at all. The title is probably a mistake, but so be it." Principal photography began on July 7, 2008 in Louisiana and also around South Mississippi, shooting some scenes at the Hollywood Casino in Bay St. Louis. Abel Ferrara, director of the 1992 film, has been quoted by various media outlets as being very angry about the film. After it was first announced, Ferrara was quoted as saying "As far as remakes go, ... I wish these people die in Hell. I hope they're all in the same streetcar, and it blows up." When asked later for his response to Ferrara's statements, Herzog stated that he does not know who Ferrara is, saying "I've never seen a film by him. I have no idea who he is." At a press conference at the Venice Film Festival after the film's premiere, Herzog said of Ferrara, "I would like to meet the man," and "I have a feeling that if we met and talked, over a bottle of whisky, I should add, I think we could straighten everything out." Nicolas Cage, Eva Mendes and Werner Herzog at the Venice Film Festival for the premiere of the film. Although production on the film was completed in 2008, the film did not quickly find a distributor for a wide release. The film had its world premiere at the 2009 Venice Film Festival, and was also screened at the 2009 Toronto Film Festival and the 2009 Telluride Film Festival. 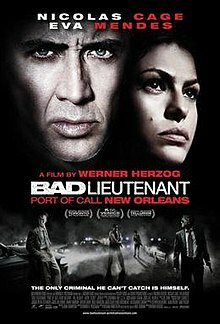 Bad Lieutenant: Port of Call New Orleans opened theatrically on November 20, 2009 by First Look Studios in 27 venues, earning $245,398 in its opening weekend, ranking number 22 at the box office. The film ended its run on March 4, 2010 with 96 venues being its widest release, having grossed $1,702,112 in the domestic box office and $8,886,990 overseas for a worldwide total of $10,589,102. The film received largely positive reviews from critics. Review aggregator website Rotten Tomatoes reports an 86% "Fresh" rating based on 138 reviews. On Metacritic, the film has a 69 out of 100 rating based on 32 critics, indicating "generally favorable reviews". The Guardian critic Xan Brooks called Cage's work in the film "surely his best performance in years." Blogging about the film from the 2009 Toronto International Film Festival, Roger Ebert declared: "Nicolas Cage is as good as anyone since Klaus Kinski at portraying a man whose head is exploding. It's a hypnotic performance." He also wrote that the film is very different from Abel Ferrara's 1992 film and that "comparisons are pointless." Ebert named the film as among the top 10 best mainstream films of 2009, and then included it in his list of the best films of the decade. Stan Hall of The Oregonian: #1 among "foreign language and indie films of 2009"
Les Cahiers du cinéma listed it second on their annual Top Ten of 2010, and also featured the film on the cover of their March 2010 issue. ^ a b c "Herzog's BAD LIEUTENANT gets a U.S. release date". 24framespersecond.net. Archived from the original on July 3, 2010. ^ "THE BAD LIEUTENANT - PORT OF CALL NEW ORLEANS (18)". British Board of Film Classification. January 21, 2010. Retrieved August 20, 2015. ^ a b c "Bad Lieutenant: Port of Call New Orleans (2009)". Box Office Mojo. Internet Movie Database. March 5, 2010. Retrieved August 20, 2015. ^ Goldstein, Gregg (July 2, 2008). "Val Kilmer, Xzibit join 'Bad' update". The Hollywood Reporter. Nielsen Company. Archived from the original on July 14, 2008. Retrieved July 29, 2008. ^ a b Douglas, Edward (July 5, 2008). "Exclusive: The Bad Lieutenant is NOT a Remake!". ComingSoon.net. Coming Soon Media, L.P. Retrieved August 11, 2008. ^ Fleming, Michael (July 2, 2008). "Kilmer, Xzibit join 'Bad Lieutenant'". Variety. Reed Business Information. Retrieved July 28, 2008. ^ McNary, Dave (May 13, 2008). "Nic Cage to star in 'Bad Lieutenant'". Variety. Reed Business Information. Retrieved July 29, 2008. ^ Siegel, Tatiana (June 15, 2008). "Eva Mendes eyes 'Bad Lieutenant'". Variety. Reed Business Information. Retrieved July 29, 2008. ^ Scott, Mike (May 24, 2008). "One hot homecoming". The Times-Picayune. Advance Publications. ^ "Werner Herzog Hasn't Seen Original 'Bad Lieutenant'". Movies Blog. ^ Vivarelli, Nick (June 20, 2008). "Ferrara has few 'Bad' things to say". Variety. Reed Business Information. Retrieved July 29, 2008. ^ a b "Werner Herzog on Abel Ferrara: 'Who Is He?'". Vulture.com. June 5, 2008. ^ Lyman, Eric J. (September 4, 2009). "'Bad Lieutenant' and bad blood in Venice". The Hollywood Reporter. Archived from the original on September 6, 2009. ^ Brown, Mark (July 30, 2009). "Herzog's Bad Lieutenant joins Venice film festival contenders". The Guardian. London. Retrieved April 26, 2010. ^ "Werner Herzog's Bad Lieutenant Added To Toronto Fest Lineup - /Film". Slashfilm. ^ "Weekend Box Office Results for November 20-22, 2009". Box Office Mojo. Internet Movie Database. November 23, 2009. Retrieved August 20, 2015. ^ "Bad Lieutenant: Port of Call New Orleans". Rotten Tomatoes. Flixster. Retrieved September 23, 2018. ^ "The Bad Lieutenant: Port of Call - New Orleans". Metacritic. CBS Interactive. Retrieved August 20, 2015. ^ Brooks, Xan (September 7, 2009). "Bad Lieutenant". The Guardian. London. Retrieved April 26, 2010. ^ Lambert, Christine (2009). "The Bad Lieutenant: Port of Call New Orleans premiere at 2009 Toronto International Film Festival". DigitalHit.com. Retrieved December 12, 2009. ^ Ebert, Roger (September 14, 2009). "TIFF #7: It was a very good day". Chicago Sun-Times. Archived from the original on September 22, 2009. ^ a b "The best films of 2009". Chicago Sun-Times. Archived from the original on August 10, 2010. Retrieved December 20, 2009. ^ "The best films of the decade". Chicago Sun-Times. Archived from the original on July 11, 2010. ^ Morgan, Kim (March 18, 2010). "Top Ten Movies of 2009". Huffington Post. ^ "Beyond the Multiplex's Top 10 foreign language and indie films of 2009". The Oregonian. December 30, 2009. ^ "Top Ten 2010, Décembre 2010 – n°662". Cahiers du cinema. ^ "Flic ou voyou ? Bad Lieutenant de Werner Herzog, Mars 2010 n°654". Cahiers du cinema. ^ "What Were The Best Films Of 2010?". NME.COM. ^ "Ten top movie hits and six near-misses". tribunemagazine.co.uk. This page was last edited on 10 April 2019, at 09:43 (UTC).